A top Spanish Snare drummer, Diego Celorio, reviewed the recently released Pipe Band Drum Score Collection. The book includes 64 Grade 4 Marches for Scottish drummers. It was composed by James Laughlin, a Professional Pipe Band Drumming Tutor. 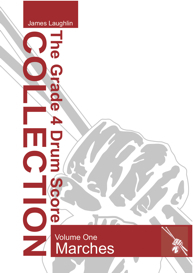 Finally – A Collection of 64 Pipe Band Drumming Scores! James Laughlin, a World Champion Snare Drummer and highly respected Professional Drumming Teacher, has composed pipe band snare drum scores for 64 of the most popular Grade 4 Pipe Band Marches. James receives many requests for drum scores that will accompany some of the most famous bagpipe tunes played by the majority of pipe bands. James wanted to help by providing the Worlds largest library of drum scores for Pipe Band Marches that can be played by almost any Scottish Snare Drummer who possesses the fundamentals of drumming. Take a look at the Contents Page to see the full listing of scores. James has a creative and musical approach to composing drum scores, his ensemble knowledge was greatly influenced by his years in the SFU Pipe Band along with an exciting Irish twist from his days growing up in Northern Ireland amongst great players and tutors such as Andrew Scullion, Bobby Rea, Gary Moore, Reid Maxwell and David Rea. If you feel a drum score is too difficult or too simple for your needs, please email James and request that the score be modified to suit your skill level. If the drum score you are looking for is not featured in the book, email James and he will compose the score you require. Take YOUR pipe band drumming to the next level! That’s right – You can now challenge yourself with the more advanced Volume 2 book of Pipe Band Drumming. James Laughlin has just released the second volume, following on from the Guide to Pipe Band Drumming Volume 1 (for learners). 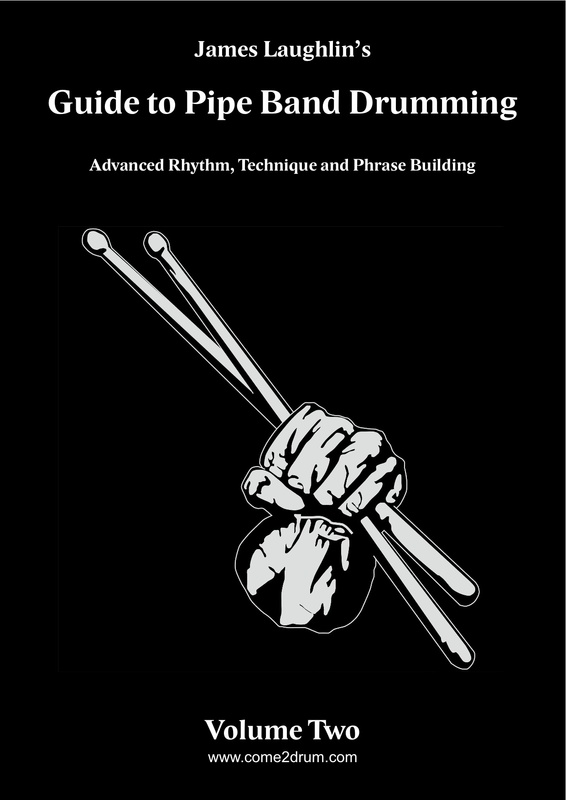 The core of the book is based on structured step-by-step development of the three key skills required to improve your drumming. RHYTHM, PHRASING and TECHNIQUE. In addition to the book, you can use the accompanying audio tracks to enhance your learning experience. What have drummers been saying about the Guide to Pipe Band Drumming Volume 2? “Hey James, I just wanted to let you know I got your new book and am loving it.” – Andrew Hoinacki, Top Grade 1 Scottish Drummer. “Check out James Laughlin’s new book!! I was lucky to see it it before release which means I’ve got a jump on all of you! haha Great mental work out for advanced drummers and has really lit a fire under my score writing. What a great tool! Thanks, James! ” – Glenn Kvidahl, Leading Drummer with the LA Scots Pipe Band. Check out more information about the book, and the AUDIO TRACKS! You can get your copy here! 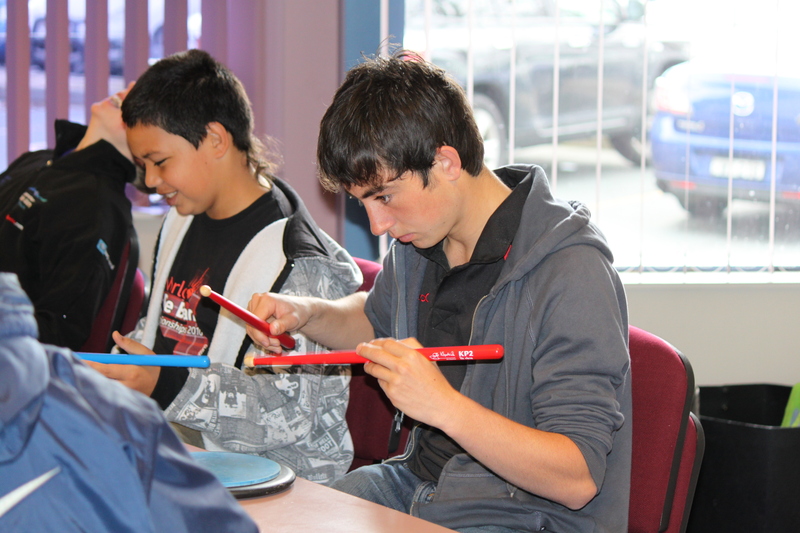 Drumming Tip – Practicing regularly is essential to improve your standard of play. But do remember to take a break, sometimes you can make more progress when you take a short break from your normal routine. REWARD yourself with a break or holiday from day-to-day practice. Drumming Tip - Practice Smart - not long! Focus on your weaknesses for 20 mins each day. Have a little practice diary and note down what your weak points are and spend time focussing on them. Otherwise, practicing can be pointless and lacking direction. Pipe Bands – competitive in nature. Pipe Bands – caring in nature. The recent string of of earthquakes in Christchurch, New Zealand has left the city shaken and frail. The city is home to a large and vibrant pipe band community. I am fortunate enough to be a part of the Canterbury Caledonian Society Pipe Band. Having spent almost 6 years in New Zealand, I have noticed a very competitive rivalry between the bands, a healthy and positive environment. However, it is evident that the bands are all very inter-connected and their love of the music unites them. I was touched when a friend from Wellington contacted me to say that NZ’s bands were putting on a concert to help with the Earthquake relief, and then another phone call from Dunedin in the south with the same intention. Emails have been coming in from Mexico, Canada, Northern Ireland, Scotland, Japan, Europe, Australia and the United States. Our community is truly a special thing, and very tight-knit. People have been reaching out offering money to replace instruments, offering their homes to get away from it all and sending their love and best wishes. It is times like this that really make us appreciate how special the pipe band fraternity is. It is not just a hobby for us all, but a passion and lifestyle. Long may this international community remain strong. Pipe Band Drumming lessons are available on Skype, you can also download the ” Learn Pipe Band Drumming” Book. COME2DRUM.COM – The internet’s source for all things related to Scottish drumming.